This wooden tissue box cover is one of the last things I snapped up at a favorite thrift store before it closed. And yes, I’m still a little pouty that the shop is gone because it was SO close to home and provided me SO many projects. But, anyway- I liked the solid construction of the tissue box cover but didn’t have a project in mind. On a whim, I challenged my Facebook page pals to give me ideas on what to do. There were several suggestions, but my favorite came from my friend, Clair (who hosts Blues Moon Radio), who suggested a bird house. And that was all I needed as motivation- I’d somehow manhandle this tissue box cover into a bird house. Maybe a funny looking one, but I loved the idea of it nonetheless. This post contains affiliate links for your crafting convenience. First things first, I disassembled what I could by removing back panel and then the plastic liner that was inside. After tossing the plastic in the recycling bin, I then needed to create a smaller bird house “entrance”; the existing oval-shaped hole for facial tissues was way too big for a birdhouse. If you remember this project, I discussed the smallest recommended hole size (per Audubon) for wrens and chickadees (which always nest in our yard). So, just like before, we used a hole cutting bit on a square of thin plywood, that I then glued to the inside of the tissue box cover, clamping down overnight. This will result in the perfect size bird house entrance for our smallest nesting birds. The correct size hole for wrens and chickadees! Because the back panel had a large finger hole (for sliding in and out easily), I also glue a strip of thin wood over it, as well. Now it’s ready for paint! Then, I painted everything white and distressed ever so slightly before sealing with top coat (inside and out). This is an important step since it’s going to be a bird house living outside! Also, check out this cheeky fly who landed on my project as I was photographing it. Painted, sealed, and ready for re-assembly. Now for a fun little embellishment that also serves an important function! I didn’t want to seal the box cover “flap” closed for ease of cleaning out the bird house, etc., but I needed to ensure that it wouldn’t open randomly once it was outside. So, I used some picture frame turn buttons that can be turned to either keep it closed or allow it to open! Not shown but other steps- I glued the back panel (now bottom panel) in place and drilled a couple of small holes in it for drainage and air flow (important for bird houses to keep mold/mildew from building up inside). To finish up my tissue box cover bird house, we took a vintage (well, maybe that’s a stretch since it only dates back to ’86…how about “pre-owned”) farm vehicle license plate, bent it in half, and secured it to the top of the bird house with washers and screws. A red “tin” roof for my white farmhouse bird house! Can you tell I wanted to emulate a white farmhouse with a red tin roof?? For this native Chicagolander, the fact that I found a red Illinois farm plate was an added bonus. And there it is! Challenge accepted and project completed. Maybe not the most perfect reuse of an old tissue box cover, but not exactly an ugly bird house, either! Ta-da! Challenge accepted, challenge complete. Side note- we attached to our back porch on the low side for photographing, but will move it up higher afterwards. Somewhere between the ground and the roof. This definitely sparked a new game in my head…maybe I’ll ask my Facebook pals to challenge me again with another secondhand treasure soon. 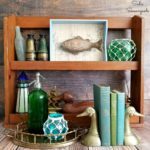 And if you’re looking for more upcycle projects for birds or outdoors, I hope you’ll check out my full collection here before you go. Would you happen to have any advice on how to put together one of the birdhouses that attach to your window so you can watch them nest? I’m not sure about materials to upcycle and my daughter wants one so bad. She’s even been working with our other animals to earn it. Could sure use your expertise on this one. Thank you for sharing your excellent new birdhouse. The kind that attaches to the glass with suction cups? I actually don’t like those because I’ve had suction cup feeders fail and fall to the ground…which is ok if it’s a feeder, but I would be devastated it it was a house with a nest and eggs/chicks inside. as always, another clever redo! charming birdhouse, most especially because of where it all started. Since I am nuts (!) about birds and other wildlife in my yard, this is absolutely my favorite. Now I will look for same type of box!! Thanks for the idea. Is your yard Certified Wildlife Habitat?? I have a blog post on it, but sounds like you’d probably qualify! That is the most unique use for your tissue box. It turned out so well. Keep up the creative work., enjoy all your projects. Thank you so very much, Charleen! Sadie, what a great birdie house! Very inspired and cute. I hope it has tenants soon!